Canada is a large, diverse country in North America with a total area of approximately 9 976 000 km2 and a population of 35.16 million.There are 10 provinces and 3 Territories within Canada. Nearly 80% of the population lives in urban areas with the vast majority of the population living within 160 km of the terrestrial border with the United States of America. Yukon Territory, Northwest Territory, and Nunavut make up 40% of the continental mass of Canada yet the inhabitants makes up only 0.3% of the population. Due to its size, Canada is categorized into seven different climate zones- Atlantic, Subarctic, Arctic, Pacific, Cordillera, Prairie, Great Lakes St. Lawrence Lowlands. Canada experiences four distinct seasons with each climate region experiencing a broad range of temperatures and conditions. Depending on the region and time of year, one can experience extremely arid and cold conditions, a humid-hot climate, semi-desert areas, and even rainforests. There are four mountain ranges in Canada: on the west coast the Canadian Rockies and Pelly Mountains; on the east coast, the Appalachians; and in the northern territories, the Torngat Mountains. Canada is comprised of prairie, hardwood and softwood forests, and arctic tundra. 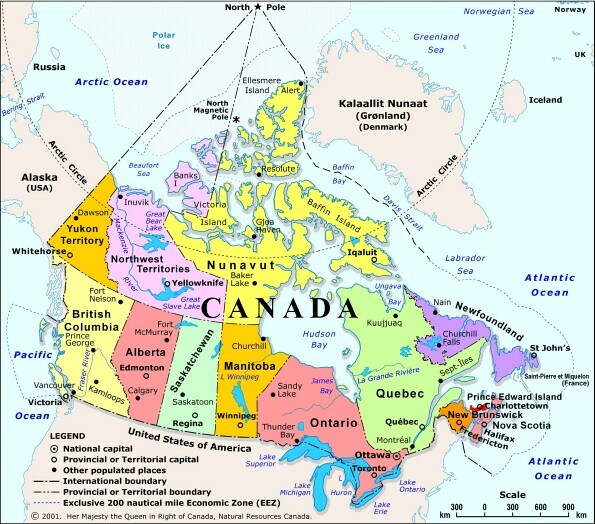 Canada is surrounded on three sides by oceans- Pacific Ocean on the west coast, Arctic Ocean on the northern archipelago, and the Atlantic Ocean on the east coast. Our southern border is shared with the United States of America, the longest undefended terrestrial border in the world. Canada has numerous freshwater lakes, accounting for approximately 20% of the world’s freshwater resources. Approximately 12% of Canada (1.2 million km2) is covered by lakes and rivers. Canada is comprised of 3 distinct Aboriginal groups- First Nations, Inuit, and Metis. European explorers first came to Canada in the 1500’s, establishing French and British settlements on the east coast, exploring the wealth of natural resources and developing a trade system with the Aboriginal population. The Royal Proclamation of 1763 by King George III ended European competition in Canada. France ceded its territories and Canada became a colony of Britain. The signing of many different treaties between the Crown and Aboriginal peoples led to the ceding of territory to the Crown allowing for increased European settlement across Canada. Confederation in Canada occurred in 1867 with all provinces and territories joining by 1949. Although Canada was originally colonized by Britain and France, today’s population is made up of many different cultures from all over the world. Parliament consists of the Crown and the legislative chamber (The Senate and the House of Commons) which is comprised of members affiliated with a specific political party. The current political system is a parliamentary democracy as well as a constitutional monarchy. The executive authority is vested formally in the Queen of England through the Constitution of 1867. Every act by the government is carried out in the name of the Crown; however, authority flows through the Canadian people. Responsibility for lawmaking is shared between one federal, ten provincial, and three territorial governments. The power to enact laws is vested in the legislature comprised of the Senate (upper house), where individuals are appointed by the Governor General to represent the provinces and territories, and the House of Commons (lower house), where individuals are elected by Canadians. Provincial cadastral systems were designed to settle colonists on the land efficiently (with certainty and speed); after dispossesing Indigenous peoples of the land. Colonization happened over 300 years from east to west with systems becoming more sophisticated over time. In some cases, systems (e.g. district lots in British Columbia) are a function of topography (mountainous terrain). Cadastral surveying is maintained at both a provincial/territorial level as well as a federal level. Lands at a federal level are known as Canada Lands and mainly consist of the three Territories, Indian Reserves, National Parks, and offshore areas. Federal lands are administered by Natural Resources Canada which maintains a separate and distinct digital cadastre and registry system. Federal lands are based on separate federal survey Act and regulations that must be followed by federal land surveyors. Land administration at a provincial level is the responsibility of various provincial government departments. Provincial public lands (Crown lands) and private lands are typically managed by separate provincial government departments. Each province and territory has its own digital cadastral map and registry system that is maintained by its respective government. In some cases, the mapping portion has been contracted to private industry. Each province and territory has its own Survey Act and regulations that must be followed by licensed surveyors. Most cadastral surveys for provincial, territorial and federal jurisdiction are completed by the private sector. In some cases, the digital cadastre is also managed by the private sector. Land registration is completed by the federal, provincial or territorial government. Each province maintains a professional organization of surveyors. In addition, there is a professional organization for surveyors who complete work on federal lands. It is estimated that there are approximately 3000 land surveyors in Canada. Each association has its own process and criteria for evaluating and licensing candidates. However, there are many common elements for between the various associations for candidates. All associations require that a candidate must have the equivalent of a university degree in geomatics engineering. Each candidate must write exams for the provincial association and in many cases, a candidate must article under a licensed surveyor for a specified period of time. Exam topics typically includes questions on statutes and regulations and practical surveying. Becoming a land surveyor typically requires a 4 year degree in geomatics or geomatics engineering. Surveying programs are offered at 5 universities and numerous colleges across the country. These degrees cover a wide array of topics such as fundamentals of surveying and cadastral systems, Geographic Information Systems (GIS), geodesy, remote sensing and photogrammetry. In some cases, a candidate can be exempt from writing exams with required courses and experience. After completing schooling, a candidate applies to write survey exams and then completes an internship with a licensed land surveyor before becoming licensed. Increasingly, cadastral systems are multipurpose, given that municipalities use them for assessing/taxing lands; and for zoning/regulating land uses. fee simple lands after being granted/patented by the Crown (maintained by 10 provinces and 3 territories, with much integration with municipalities). CLSR/ILR which capture all Canada Lands parcels, all Indian Act (and First Nation Land Management Act and self-government) interests. Other crown lands interests, held in a hodgepodge of registries and inventory systems across the 11 jurisdictions. top-down paternalism to bottom-up empowerment (devolution). The 13 jurisdictions in Canada are maintained through a variety of different registries. Much of Canada operates under the Torrens system; however some jurisdictions still operate under the Deeds system. At the federal level, surveys and parcels are maintained in a publicly searchable digital survey registry known as the Canada Lands Survey Records (CLSR). Title to Indian Reserve lands (considered federal lands) is maintained in a separate registry known as the Indian Land Registry (ILR) for Reserve lands. At the provincial level, registries typically require an account to search and access to both cadastral mapping and title documents. Almost all provinces and territories maintain a digital cadastre comprised of digitized surveyed boundaries and parcels (both rectilinear and riparian). As federal lands and provincial lands are administered differently, a provincial digital cadastre will have holes in it where federal lands exist. The federal government as well as most of the provinces and territories maintain a digital cadastre that based on a vector model comprised of both polygons and linear features. There is no nationwide cadastre that shows all the jurisdictional data in one area. Instead of discussing all of the different jurisdictions, the federal cadastral map will be discussed as an example for the cadastral template. 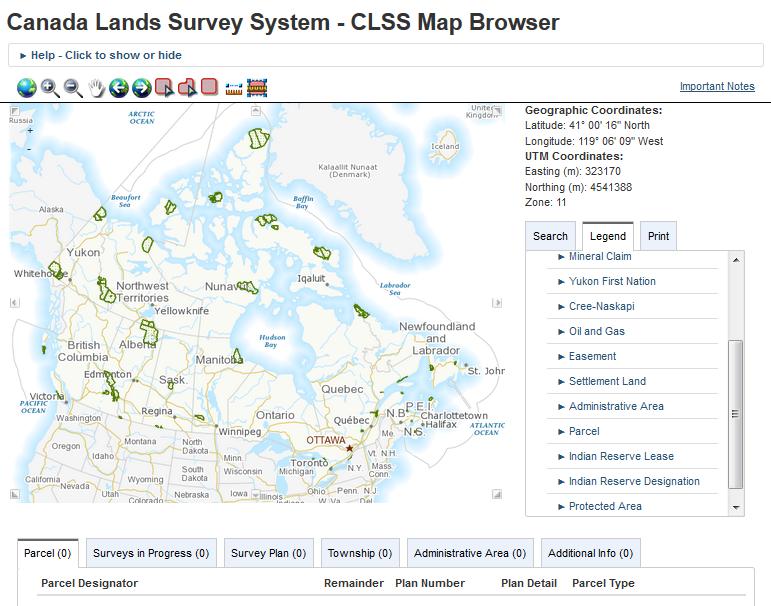 The federal Canada Lands Survey System (CLSS) was first digitized in the late 1990’s by the federal government. Today, the Canada Lands digital cadastral data is updated every 24 hours to provide the most up to date information for clients. The information is publicly available through a Map Browser (including road and topographic data), downloadable Google Earth KML files, and downloadable ESRI shapefiles for parcels and administrative boundaries. Each of these formats is free to use and download and is easily searchable. The CLSS map covers all Canada Lands- Indian Reserves, National Parks, Yukon Territory, Northwest Territory, Nunavut, and the offshore. Various layers include administrative boundary parcels, township lines and polygons, parcel lines and polygons, surveys in progress polygons, easements and right-of ways lines and polygons (including oil and gas development), mineral lease polygons, and parcel identifiers (PINs). Each of the data features is dated uniquely identified. Underlying road and topographic layers are also available. 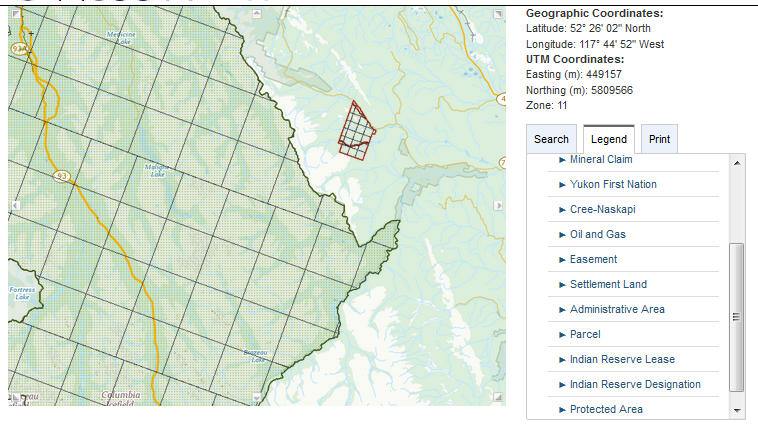 CLSS Map Browser showing the township grid in Jasper National Park (on left) and Indian Reserve Alexis Cardinal River 234 (on right). The CLSS geospatial dataset is mainly used as reference material and cadastral line and parcel vector data for clients. This data can be used for data analysis and provide a visual representation of federal lands within the Canadian survey fabric. The federal government datasets with geospatial representation of parcel and boundary information are not to be used for defining boundaries. Administrative decisions should be based on legal documents and legal survey plans. CLSS data should not be used for other purposes such as utility mapping due to accuracy limitations. Federal government cadastral data is publically available for download. Communities and organizations have the ability to download the cadastral data to integrate it into their own datasets for community planning and development. This data has been used by indigenous communities in sustainable community development and to add to their own privately maintained digital cadastre. duplication across land surveying associations (11 in toto). conflict at the land-water interface over title to beaches (public-private).